Sometimes, we don’t want junk emails from a particular email address either due to harassment issues or due to other issues like unsubscribing from particular email list when there is no other way to unsubscribe. Whatever be the reason, we just want to block the annoying sender from bothering us anymore so that we could effectively concentrate on important work using our time judiciously. Blocking emails is actually a fake concept. In reality, it just means that emails from a particular sender is ignored, deleted or made hidden. The sender doesn’t know that their email is blocked by you. Hence blocking email from a particular sender means that the email will be delivered to you but will be either deleted or moved to a hidden location so as not to disturb you. So, Blocking a particular email address of a sender is different from blocking chat contacts in Google Talk or blocking friends on facebook or yahoo contacts on yahoo messenger. In the latter case, blocking actually works as the sender won’t be able to communicate with you and he’ll be slapped with a harsh message or notification that he has been blocked. In this tutorial, we’ve listed 3 ways to block people from sending emails, follow the method you find interesting and easy. How to block, unblock particular sender in outlook.com email ? Login to your outlook account online. Open the received email from the email address you want to block. In the overlay popup that appears, select Also block future messages checkbox. Hit on Delete All button. Done! Now, you won’t receive any email from that particular email address. What if you change your mind. What if, at a later stage, things between you and the sender worked out and you want to open your heart for that email address. Well, you can easily unblock any blocked email address by following the steps given below. Click on gear/setting icon in your email account on outlook.com and hit on More Mail Settings. Under Preventing Junk Mail Section, hit on Safe and Blocked Senders. Now click on Blocked Senders option. In the right side, all blocked email address will be listed. Just choose the desired one and hit on Remove from List option. From here you can block any other email address or sender by typing the email address manually in the left side and clicking on Add to list option. You can even block all emails from any email address originating from a domain name. For example, you can block all emails from xyz.com and not just a particular sender from xyz.com i.e. abc@xyz.com .. Just enter the domain name- xyz.com to blacklist and add to the list of blocked senders. Go to your mail settings by following the methods described above. 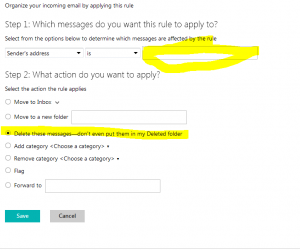 Under Customizing Outlook section, choose Rules for sorting new messages. On the next screen, Choose Sender’s address in the first box, choose is in the middle box in the top row. Enter the email address to be blocked in the right-side box in the top row. Select – ‘Delete these messages – Don’t even put them in my deleted folder’ radio button. And click on Save option. Of course, you may choose other option or criteria there as per your requirement but the above mentioned guide is the recommended way to block people from sending you emails. If you blocked someone using this method and in future if you want to unblock the person, you need to follow upto step 2 and then delete your rule from the list displayed in the next screen. So, this was comprehensive guide. If you know any more great ways and new methods to do the same task, we’d love to hear from you in comments. We’ve also published several other productive tips on using Outlook Email service more promisingly, take time to check those tutorials as well which might help you in managing your outlook/hotmail account in a better way. If you’re gmail user, we’ve shared our guide on How to block emails from some in gmail.